Purpose: The purpose, first and foremost, is to read God’s Word in an unhurried manner and to allow its transforming power to do its work in us. Because this is a challenge that happens during Advent and Christmas, passages have been selected that in some way help us to reflect on themes related to the season. 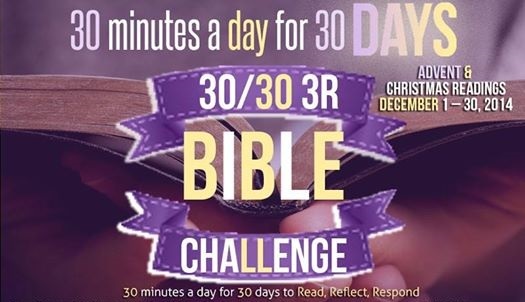 To accept this challenge, you are asked to commit at least 30 minutes each day for reading, reflecting upon and responding to a passage of scripture. For some, the response may be as simple as “pondering the message and the meaning in your heart.” For others, you may want to engage in a more elaborate response. It is up to you to decide how to best respond to allow the word to penetrate your hearts and minds and get into your being. The main thing is that you read and spend time in the Word. You are challenged to give it a try for 30 days and see what happens. 1. Read the suggested passage or a passage of your own choice. 1. Read what comes before. 2. Read what comes later. 3. Read any other scripture references or commentary your Bible may give. 4. Look for repeated words. What do they tell you? 5. Look up unfamiliar words. 1. What meaning do you think it had for the people of that day and time when they heard the story? 2. What meaning does it have for you/us in this day and time? 3. Where is God in the story? 4. How can this affect what you do or believe? 2. Post it. Post a response to the St. James Facebook page. 3. Journal it. Keep a journal and write your daily reflections. 4. Tweet it. We’ll give you a daily hashtag that can be accessed through the Facebook page. 5. Draw it. Express your response through a drawing for your own consumption or to share. 6. Write a letter to yourself or someone else. 8. Express it in your own creative way.